The one constant in the world is change. Our planet has been in a constant state of change since its beginning. Nothing is permanent and for photographers that’s not something to fear, it’s something to be embraced. There are few places on Earth where change is more apparent than on the Big Island of Hawaii. I’ve been traveling to this incredible island with my camera and lenses almost every year since 2010 and it never gets old. I’ve explored just about every mile of coastline, hiked through rainforests and lava flows, lost gear to rogue waves, hovered over craters full of molten lava, flown into canyons at 2,000 feet above sea level with waterfalls still towering 1,000 feet above, watched humpback whales leap out of the water, and watched in awe as lava entered the ocean from mere feet away (and those are just some of the highlights). The Big Island is simply beautiful, and that beauty comes at a cost. 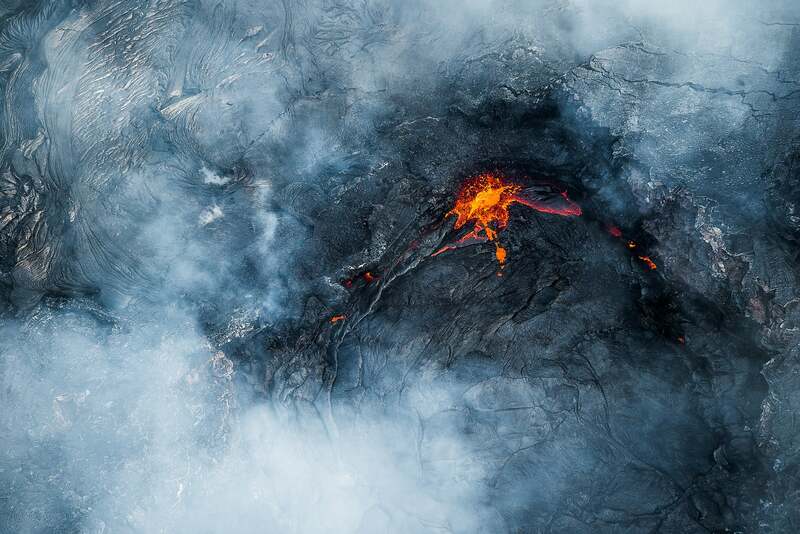 As just about everyone knows, the southern part of the island has been devastated by the lower Puna eruption, an ongoing volcanic event on Kīlauea’s East Rift Zone that began on May 3, 2018. What’s crazy is that this eruption is just part of the ongoing eruption of Kīlauea that began back on January 3, 1983 and hasn’t stopped since. The lower Puna eruption is changing the face of part of the Big Island as the tidal pools at Kapoho and Kapoho Bay have been erased. And tragically, the lower Puna eruption has claimed over 700 homes. There are other changes happening, too. Here’s an image I took from the Jagger Lookout at Volcanoes National Park just a few months before the eruption began (the park is now indefinitely closed). I remember that night like it was yesterday. I was like a little kid in a candy shop because after visiting this location countless times, I was finally seeing lava in the crater. 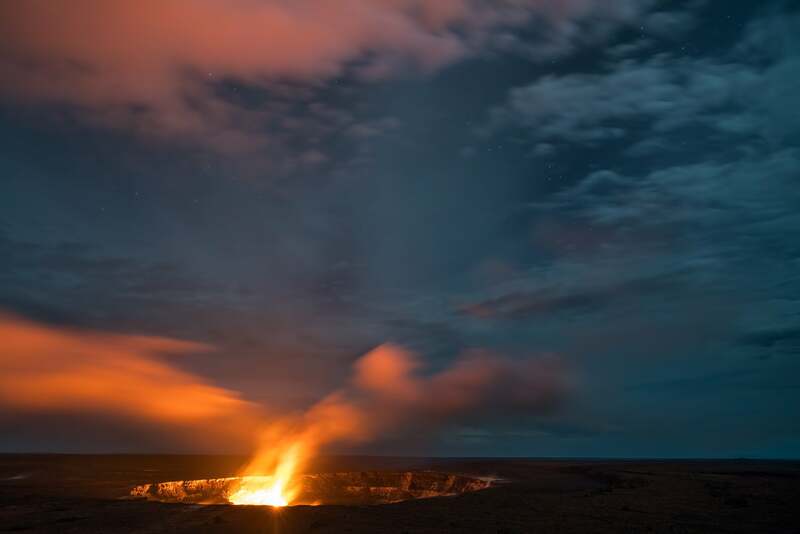 You see shots similar to this all the time; a dusk or night view of the crater with an orange glow coming from inside. What most people don’t know however is that the red glow is just that — a glow. It’s not a photograph of actual lava. As night approaches, the glow from the lava gets more and more intense, eventually illuminating the smoke cloud rising from the crater. That day though, the lava lake had risen considerably and the entire time we were there it was splashing up in the air and making all sorts of crazy sounds. The lens flare in the image is because of ACTUAL lava being exposed by the camera, not just the glow. Pretty amazing! This is all gone. Forever. The Halemaumau Crater at the Kilauea summit has completely drained and the crater itself has almost tripled in size from an ongoing series of explosions and shelf collapses (a current view of the crater can be found here. I’m so glad I got to enjoy this place so many times. Maybe the lava lake will return again in my life. Whether it does return or not, it will never be the same, though. Another landscape casualty of the lower Puna eruption is the Puʻu ʻŌʻō Crater. Here’s the last shot I have of it, looking straight down into the lava lake from a helicopter about 500 ft. above. Pu’u ‘O’o Crater, Hawaii. Sony α7S, Sony FE 70-200mm f/4 G OSS lens. 1/1250-sec., f/5.6, ISO 800. Just like Halemaumau, Puʻu ʻŌʻō has been completely drained and the lava redirected toward Puna. The before and after images of this crater are unreal! Before I finish this article, I want to say that I HIGHLY recommend booking a trip to the Big Island. Not in spite of the current eruption but BECAUSE of it. The local tourism economy needs it as people work to resettle their families and rebuild their homes, and as a photographer, one gets very few chances to record change on this scale as it’s happening. I HIGHLY recommend booking a boat or helicopter tour! This is the only place on Earth where you can view lava entering the ocean. I’ve seen some incredible things in my life and this is one of the most intense. Like I said in the title, change is the only constant. So get out there and see as much of the world as you can before it changes again.